We recommend yearly exams for all your pets! As your animal ages their immune system may change which can make them susceptible to illness. Annual or bi-annual exams are important for the health of your animals to help us monitor their overall wellness and provide any necessary preventative care. Have a new puppy or kitten join your family? Call us today to set up their first wellness exam to ensure that they are healthy. It is important to have your new puppy or kitten seen to get them started on their vaccinations and to make sure they are happy and healthy. Young animals are more susceptible to illness due to their still developing immune systems. We ask that all cats come to their appointments in carriers and dogs are properly restrained on a leash. 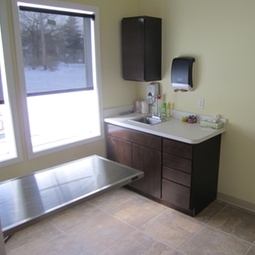 We offer private exam rooms for the comfort of you and your pets!